ASGT’s production of “In the Heights”. Photo by Alison Harbaugh of Sugar Farm Productions. It isn’t hard to imagine being on the streets of New York when you step inside the Annapolis Summer Garden Theatre (ASGT) this season. “In the Heights,” the lively Tony and Grammy Award-winning production conceived by Lin-Manuel Miranda (you know the MacArthur genius behind the hit show “Hamilton”), brings both the swagger and the sweetness in this highly irresistible production directed by Darnell Patrick Morris. Welcoming you to the predominantly Dominican neighborhood of Washington Heights in Upper Manhattan is Usnavi De La Vega, a charismatic, lyric-dropping bodega owner and genuinely nice guy played by the animated and talented Tim German. Onlookers encounter one happening barrio complete with a beauty salon, mom and pop car service, apartment buildings and enduring bonds in this super tight community of first- and second-generation immigrants just working hard to achieve their dreams. Add some Latin music, dazzling dance, phenomenal singing, budding relationships and a little drama into the mix, and you’re in for one entertaining evening. Every single cast member of the ASGT “In the Heights” production deserves a shout out really, with each bringing a Broadway-caliber performance and their own individual style to this show. All of the parental figures–Kevin and Camila Rosario (Steve Castrodad and Nikki Arbiter-Murphy), and Abuela Claudia (Cynthia Bolin) who raised Usnavi, approach their roles with conviction and care, and shine in their respective solos–“Inútil,” “Enough,” and “Paciencia y Fe.” Actors Cory Jeweler who plays Benny and Anthony Johnson as Usnavi’s cousin Sonny, add lightheartedness, warmth and humor as well. Other outstanding moments include the festive number “Carnaval Del Barrio” featuring salon owner Daniela portrayed passionately by the funny and vibrant Mayumi B. Griffie, who together with the rest of the energetic ensemble just makes the audience want to dance out of their seats. Perhaps, one of the most powerful voices comes from the person pushing the shaved ice cart, the Piragua Guy, played by Tobias A. Young whose strong voice is quite stunning. 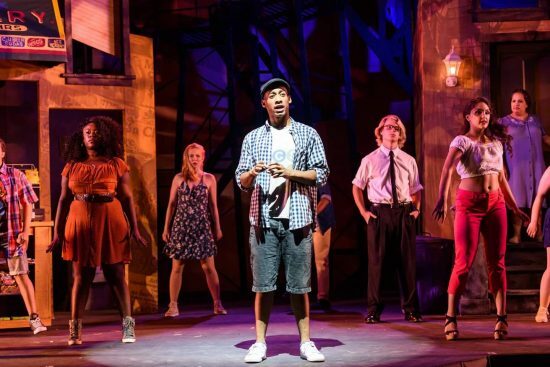 The Annapolis Summer Garden Theatre’s production of “In the Heights” leaves you feeling happy, hopeful, and wanting to see it una vez más. Running Time: Approximately 2 hours and 25 minutes with one intermission. “In the Heights” runs through September 3, 2017 at the Annapolis Summer Garden Theatre. For tickets call (410) 268-9212 or visit here.